As the name suggest Willem is of Dutch descent and emigrated to the Whitby area in 1985. 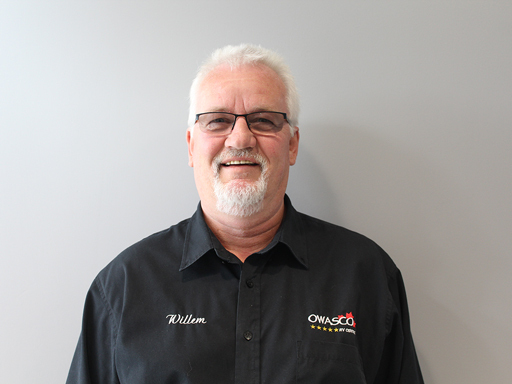 Willem has been at Owasco in various roles for almost 30 years and has a wealth of experience in the RV industry. In his home life he and his wife of 34 years with 2 grandchildren, enjoys fostering kids for the Durham Children’s Aid Society. Willem loves cooking, good food and spending time with family and friends. “My wife and I bought our first RV. We were met by salesperson Willem. He was a gentleman. Never pressured us. Patient, and honest!! Everything he told us turned out to be accurate. He serviced the unit prior to pick up and went above and beyond simple repairs and safety. More importantly, after we bought the unit, we had a ton of questions and he answered our emails and calls from the road and after hours. It was and remains a pleasant experience, and one that has provided us with value and a go to place.” – Shelly-Lyne S.
“Is the best in RV Sales and overall customer experience. Thank you for all the assistance. All the best.” – Dave M.
“Loving our motor home and grateful for excellent service. Each time we go in to Owasco, we are felt at home.” – Judith B. “The staff in every department we dealt with were smiling, knowledgeable and very patient with us as first time owners. Willem always greeted us when we came through the door and guided us through all the stages. We should mention Doug Kemp, Ryan and Derek who are taking such good care of us.” – Marcel C.
“Our experience was great. I think we received a red carpet treatment. Everything was looked after and we were on the road the same day. Thank you Willem and Owasco. We will deal with you folks again I’m sure.” – Jaqueline M.
“Willem has such a warm and welcoming smile that we were instantly more at ease with our purchase as ‘first timers'” – Graham T.
“The staff and management were very helpful and went out of their way to make sure we were completely satisfied with our recent purchase. We are second time customers and will certainly deal here again.” Peter W.
“Willem showed us a few trailers before we made a decision. We chose and received a very good walk through and delivery of our trailer. I would have ranked a five if not for a few misunderstandings or misscominications along the way. Will consider to look at Owasco and Willemstad for future trailer needs.” – Donald M.
“Services included – service on trade in; helping us find the right product for a move into a larger unit and an integrated process through different specialists.” – Reginald E.
“Met Willem at the RV show. He followed up as planned. I worked with him throughout the process. Very professional.” – Don and Julie P.
“Great experience dealing with Willem, no high pressure tactics. Good deal and even gave a liitle extra. I will be back as a returning customer when the time is right.” Angela R.
“Thank you Willem once again, for helping us get to know and love our new Jayco Greyhawk! Always being there to answer our questions was much appreciated. We love our new ride, and will always be back to see you when we upgrade – again, and again :-)” – Fulvia L.
“Very informative, no pressure, helpful, answered all of our questions. Explained the warranty package, introduced us to the service department and went over in detail all of the trailer parts.” – Paul D.
“Amazing service not pushy very friendly and helpful. Willem was a delight to deal with and we will recommend him to our friends and family. Happy to be part of the Owasco family.” Alan P.
“Willem was very respectful and spent lots of time with us teaching us the ins and outs of the trailer. All around a good experience.” – John S.
“Willum made the entire sales process comfortable and relaxed and was very professional. The orientation was very professional and we were left with a very good impression of your organization. Thank you” – Jerry K.
“Owasco is great for service ( Peter ) and sales ( Willem ). Their service and knowledge is fantastic. I m sure all the staff is great and would recomend Owasco for it.” – Frank B. “I’m completely happy with the support I received from Willem Woudwyk at OWASCO RV Centre. He was helpful without being pushy, ensured someone helped us when he was not available and answered all our questions about our new camper trailer. We couldn’t have asked for anything more!” – Dave C.
“We recently purchased a 2015 Jayco 5th wheel trailer through Willem at Owasco. As part of the deal we traded in a 2007 Cougar 5th wheel trailer. Throughout the purchase Willem was very helpful in helping us make our decision. We were happy with the experience.” – Lisa L.
“We enjoyed purchasing the trailer through Owasco RV. Willem was very pleasant and knowledgeable and very patient as we are new to trailer ownership and had many questions and wanted to see all of the options. They were able to outfit our truck to be able to pull the trailer and I enjoy a one stop, full service experience. I would fully recommend Owasco for you RV needs. The only reason I chose 4 stars instead of 5 is because we ordered a new trailer and it took longer than expected to arrive, everything else was excellent and 5 star.” – Duncan B. “Enjoyed the experience from the moment we walked in. Informative, no pressure dealings with our sales person on all products we expressed interested. Enjoyed the indoor showroom to easily see differences with the many of the models. Orientation session for our trailer was outstanding, we learned everything we needed as first time trailer owners. Outstanding from start to finish!” – Paul K.